The staff of Israel's embassy to Jordan, including a security guard involved in a shooting incident in which two Jordanians were killed, have returned to Israel from Amman. Yesterday’s fatal shooting incident tested already tense relations between Israel and Jordan, one of two Arab states with which it has peace treaties. Jordan wanted to question the guard, who was slightly hurt, but Israel said he had diplomatic immunity and should be repatriated. Israel's foreign ministry said the security officer had acted in self-defence when he shot his attacker, a workman at the embassy compound. The Jordanian bystander appeared to have been killed accidentally, an official said. In brief remarks to reporters today, Prime Minister Benjamin Netanyahu said he had phoned the guard and "promised to bring him back". Israeli-Jordanian tensions have escalated since Israel installed metal detectors at entry points to Al-Aqsa mosque in Jerusalem after two police guards were shot dead by gunmen there on 14 July. Jordan is the custodian of the complex and has a large Palestinian population, making Amman sensitive to any changes of status at the site which Israel captured along with other East Jerusalem and West Bank areas in the 1967 war. Israel's foreign ministry said the Jordanian who stabbed the guard was a workman who was at the embassy compound to replace furniture. A second Jordanian, who owned the rented property where the work took place, was accidentally shot dead by the guard, an official briefed on the incident told Reuters. The first Jordanian, Mohammad Jawawdah, was 16 and had no militant links, his father said. "My son was not a trouble-maker or a terrorist and he didn ot belong to any political parties," said Zakaria Jawawdah. "I want to know how the investigation is going and know what happened and what led to the killing of my son." Jordan has confirmed there were Jordanian fatalities and a wounded Israeli in the incident, but has not elaborated. 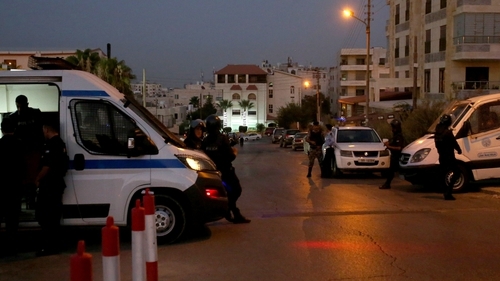 The Israeli embassy in the affluent Rabae district of Amman is protected by Jordanian gendarmes. It has long been a flashpoint of anti-Israel protests at times of turmoil in the Palestinian territories. Violence against Israelis is rare in Jordan, a tightly policed country that is also a staunch regional ally of the United States. It also shares a long border with Israel.